This was the highlight of my 2006 season. Seems this nice 10 point buck I have been hunting for a while was always one step ahead of me. I saw him so often but had so many things go wrong that I named him Murphy. I was beginning to think he was invincible. Twice he has actually ducked an arrow as it sped towards it's mark. Another time just as I went to draw on him a bobcat crossed his path and spooked him. Twice other deer saw me sneaking up on him and blew the whistle, and once a loud jeep out wheeling the swamp made him run for cover as I closed withen 15 yards of him. Finally though he messed up or I didn't and Murphy's law was broken. I had hid in the root mound of a tree (fallen by recent windstorms) along a creek he followed to his bedding area. In the twilight of the dawn he passed by me withen 20 yards and I was able to take a clean shot at him. Even then though it didn't go according to plan. Startled by the bow's "twang" and the sound of feathers cutting air he turned and the arrow's destination was altered. Not the ideal shot anymore but it should prove fatal none the less. Big bucks sometimes don't die easy and this one would prove that true. He was a runner. He ran a few hundred yards out of the swamp and hid in some thickly pined ravine in the oak highlands. The problem with tracking him was that the morning was breezy and the trail was being literally blown away. The distance he covered in seconds would take me hours to follow. I called in a favor and soon Matt was there to assist in the pursuit. As Matt searched the leaves and grasses for traces of his trail I scouted ahead for the deer himself. Eventually I found myself on a faint deer trail desending into the pines. Suddenly I spotted fresh blood at my feet. Looking up I saw Murphy standing in the pines watching me. My hand found an arrow in the quiver and instictively nocked it to the bow. It was in vain because as my eyes meet his he was off and running again. Unable to rush him in the heavy pine cover I called to Matt. We discovered the buck had now left the pines and headed up across a small oak savanna. Our plan would be to have Matt trail the blood while I flanked him with my bow at the ready. The forest was open here and I could easily see over 100 yards but yet I did not see my buck. I wondered just how far would he run this time. We were already five hours into tracking him. The topography changed again as the oak ridge decended into a lake basin. I could now see for hundreds of yards but no sign of a running deer. Matt chattered a squirrel call to get my attention. He signed to me that the blood trail appeared to go straight into the lake. I know deer are good swimmers but several ducks swam about on the water as if undistirbed. It appeared he must have only made his way into some of the tall grass at the edge of the small hidden lake. By now he was tired and weak from the loss of blood that had led us to his secret hiding places. As the ducks took to flight. I closed in to just a few yards from him. He either had to deal with me or the water. My first thought was to draw my knife and finish this but as I sized up the arsenal he carried on his head I knew if he turned on me it wouldn't be good. I again nocked an arrrow and asessed the situation. I knew the first arrow he had taken would eventually prove fatal but I was also aware of the worse case scenareo and didn't want to chance it. Not to mention I was already upset that the first shot had not been a clean kill. As he made his move I made mine and my arrow hit it's mark. It passed clean through the liver and heart and I knew now it would all be over in a few seconds whether he turned on me or not. Nothing about this hunt had been easy and he wasn't about to change that now. He decided to run again and headed straight into the lake and I had no choice but to follow. Tossing my bow, quiver and jacket into the grass I ran into the shallow lake after the buck. The bottom was muddy and his strength was fading fast. I knew I had to stop him before he made deep water and drowned. The November water was cold but I hardly noticed that as I focused on some way to stop him from getting deeper or going under. A deer's hoofs can cut you open so wrestling with him in the water was a bad idea. Instead I got just close enough to lasso his antler with my belt and turn him around. That was all he had and as he expired I drug him back to shore. Matt threw the other end of my quivers belt to me and helped me make it through the mud. After a silent prayer of thanks all that was left to do was to field dress him and the long drag out of the woods. "You dishonor an animal if you take it's spirit without knowing and respecting the way it lived." 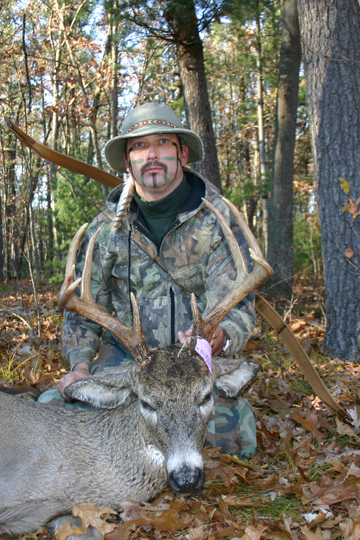 Great story and an awesome buck. Congrats!! The old order is passing. Swiftly receding into memory are the days of strong, earnest men who followed an atavistic yearning to pit their skills against wild animals. Congrats and I agree, great story! Neat story, nice buck! thanks for posting it. Great story and deer. Congrats! !